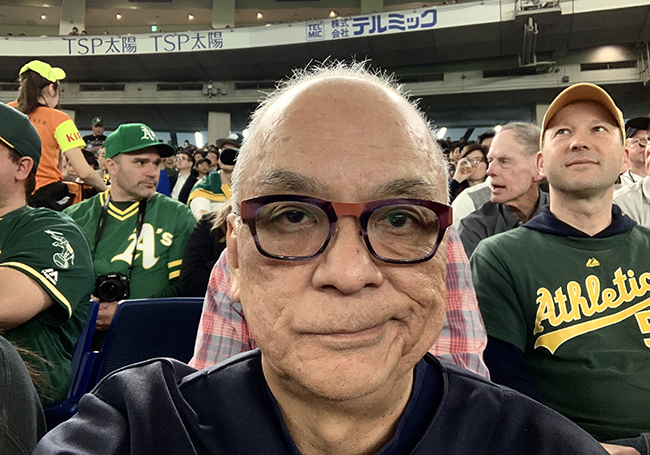 TOKYO, Japan — Over four games here in Japan, Ichiro Suzuki went 0-for-12. He got on base once with a walk, struck out twice with a runner on second, and still, when it was all over, the crowd went crazy. The evidence on hand in Tokyo to open his 19th season in Major League Baseball, however, was all too real. The legend who once could make contact with anything and run it out for an infield base hit, even balls in the dirt, had a shaky spring, with just two hits in 25 at-bats in Cactus League play. Over two exhibition games between the Mariners and the Yomiuri Giants, I saw him take called strikes and make awkward swings. There was no joy in Mudville: Mighty Casey was striking out. Then came the Opening Series, real games that counted against Oakland. Scores of A’s fans made the trip, filling sections along the third base line behind the A’s dugout with a healthy scattering of green and gold; it was my misfortune to be seated among them and their chanting of “Let’s go, Oakland (clap-clap, clap-clap-clap).” But everyone was united in rooting for Ichiro. If anyone could rise to the occasion, Ichiro could. He got two at-bats in Game One. He made an out. He got a walk but was stranded at second. At the top of the fifth M’s manager Scott Servais took out Ichiro so the crowd could give him a standing ovation. By Game Two, the only goal now was for Ichiro to get a hit, just one hit so he could go out on a high note. But the best he could muster was a ground out, a fly ball, a called strike three, and finally a ground out to short that he was unable to beat out. He was taken out in the bottom of the eighth and the game stopped. On the field, he embraced every teammate. In the dugout, the youngster Kikuchi patiently waited his turn. Ichiro finally made his way to him and gave him a hug and Kikuchi burst into tears. I watched him turn away and try to hide his face with the bill of his cap, then wipe away his tears. The crowd roared as Ichiro disappeared into the locker room. The game goes into extra innings and the M’s finally win it in 12. As people in front of me leave, I work my way down to the netting behind home plate. The game is over. Dee Gordon is interviewed on the field, and the grounds crew comes out for field maintenance. But then something wholly unexpected happens. The crowd refuses to leave. From the 46,000 fans in the sold-out stadium who still pack the stands comes a refrain that starts low and quickly gains strength: “I-CHI-RO, I-CHI-RO!” No one wants to let go of this moment. It is unplanned. It is spontaneous. But we all know in an instant what we want. If we stay and chant and clap and stomp long enough, the man will HAVE to come back out. I see a pulse of activity among the media on the field. They are running to the dugout to kneel and train their lenses on … something. He was coming! No, he wasn’t. Five minutes pass, then 15, then 30. The photographers sag back, but so long as they’re not leaving, we aren’t either. Then flash strobes began to pop. Ichiro emerges, still in his M’s uniform and cap. He shakes his head in amazement, and walks clockwise around the edge of the stands, waving, sometimes raising both arms in a salute. As he passes right field he looks back to spot the famously loyal Ichimeter lady who came from Seattle with her black and neon-green Ichiro hit-counting sign, and he points directly at her. At times he disappears from view inside the cloud of photographers buzzing and jockeying for position all around him. He comes around to where I stand, pressed against the netting behind home plate like a kid, and waves to us too. At third base, the cameras are pushed back so he can stride out to mid-field, alone, and doff his cap to the crowd, revealing just how white his head of hair has become. And then he skips back to the third base line and with a final salute with outstretched arms, disappears back into the dugout and off the field as a player for the absolute last time. He didn’t get a hit, but it no longer mattered. His 4,367 hits were enough.